Happy Kitchen Sink Stamps Monday, I'm so glad you stopped by today! 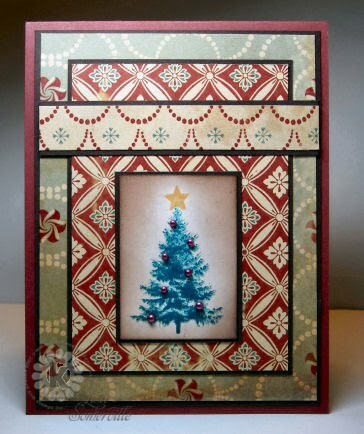 I just love the Multi Step Pine Trees, and this week I wanted to create something a little more vintage with the images. Instead of stamping the pines in shades of greens, I went for the shades of blues to match the beautiful Cosmo Cricket papers I used. I stamped the star from the Multi Step Ornaments &Star, then finished by sponging the edges with Caramel and Chocolate Chip Inks. The ornaments are stick on gems from Kaiser. Don't forget you have until November 27th, to enter this months Kitchen Sink Stamps Challenge, click here for more details. We'd love to see what you create using Kitchen Sink Stamps! This is really pretty, all the color and then the FAB tree! It's just poppin' out! The shades of blues are beautiful, great piece. Love your beautiful blue Christmas tree, Lisa!! What a trip down Memory Lane!! I remember these from my childhood!! Beautiful papers and layout!! Great holiday card!! So beautiful, Lisa! 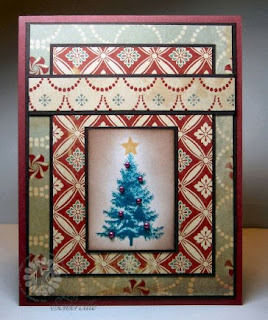 Love the vintage look to this tree! Such a wonderful mix of papers too!! Stunning!! This is so gorgeous, Lisa!! Love how you mixed the designer papers. The pearls are added the wonderful texture on the tree! Wow this is beautiful. Love that tree.